People here say we’ve had a colder winter than usual, and that it’s lasted longer. The entire South has had an unusual winter, but our corner of the country has, for the most part, been a weather oasis. 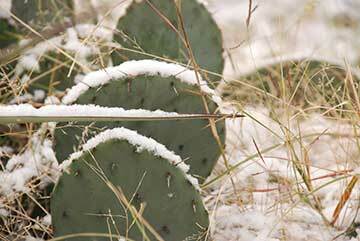 Sure, it got down to ten degrees one morning, and yes we had to close the road to the Chisos Basin a couple of days because of icing. But when people arrive at the sunny Persimmon Gap Entrance Station here in Big Bend National Park, they’re usually telling of snow, sleet, ice or rain to the north. Many folk arrive with license plates from the really frigid places – Minnesota, Michigan, Alaska, Ontario. A few Mainers trickle in, too – from Whitefield and Augusta most recently. Lots of Texans, who may drive 12 hours from Houston or Dallas to get here. I keep checking Maine weather, and shudder at the little squares on the NOAA website with snowflakes all across the board, and zero temps. Then I type on our zip code, 79834 and get a much more pleasant forecast. With the first frosts in late November or early December, the oaks in the canyons turned gold and held the leaves until the big windstorm in early January. 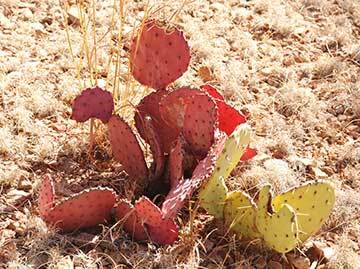 The grasses are bleached manila and burnt orange, but the prickly pear still poke their green pads above it all. One species, the purple prickly pear, turns a lovely violet color at the onset of cold weather, sometimes stopping you in your tracks to see what kind of tree that must be blooming on the far hillside. 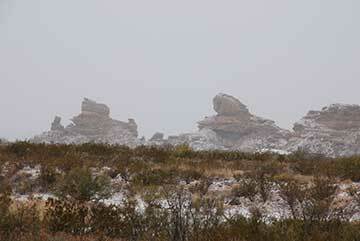 We got snow one day, which for most of us is an incongruous sight in the desert. 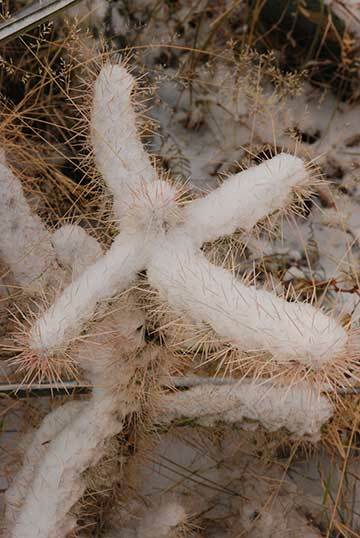 Employees made tiny snowmen (well it was only a little dusting of snow) and took pictures of the cactus and ocotillo rimed with the white stuff. A park ranger and our 2010 Calendar photographer in the Basin, at 5400 feet elevation, sent some of the photographs he’d taken of the wild hoarfrost up there, and I was insanely jealous. I had to work that day and could only take a few snapshots on my way to work at the lower elevations, which really wasn’t that dramatic. A few weeks later we had an ice fog in the mountains, and my friend Shanna – a Southerner not used to winter drama – made several trips with her camera and Flip video to record the inch-thick frost crystals coating everything. I had to work that day, too, and again I was insanely jealous. 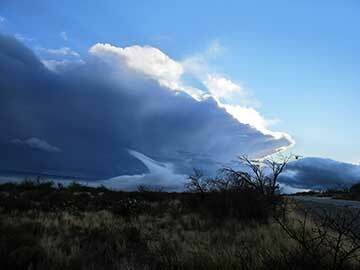 Just when we think winter might be over, we get another “blue norther.” Thursday’s storm brought us a huge clap of thunder, a bit of rain, a smidgen of tiny hail, and dramatic ground fog that flowed westward while the broken clouds above scooted east. Then yesterday we had a huge moon. It was 30 percent brighter and 14 percent larger than usual because we were at the moon’s perigee – its closest point to earth on its elliptical orbit. 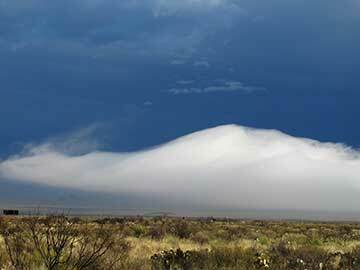 I photographed it on my way home from work, rising like a beachball behind the Deadhorse Mountains, and this morning on my way to work caught it setting to the east of Persimmon Gap. Mars was close to it at two o’clock, not looking as red as it had several years ago. 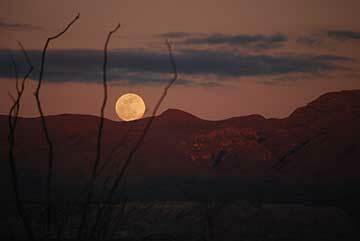 Full Moon Jan. 29, 2010 – Deadhorse Mts. The small hands of bluebonnet leaves are already clumping in the desert and we know these rains will help give us a spectacular wildflower display. 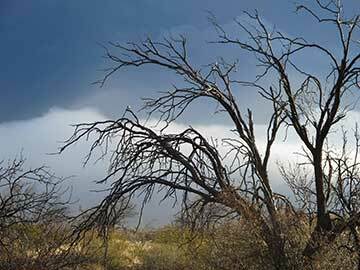 Cactus will bloom soon as well, and the shirtsleeves will be short as we hike, and we will see young critters and hear more of the birdsong that is just starting to ring out in the creosote chaparral. We are on the cusp of Spring, and we are all awaiting happily. 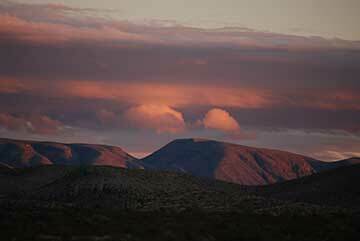 The gratuitous sunset thrown in for good measure – Deadhorse Mts. One would assume that coming to a national park implies a certain amount of respect for the park resources, and that respect means following the rules. Fortunately, being Way Out In the Middle of Nowhere, Texas, Big Bend National Park doesn’t attract as much riff raff as some of the other parks situated near large population centers. However, there’s always that handful of folk that make you wonder about the human race. For instance, TP Cairns. A cairn is a little rock monument built to mark a trail. Sometimes people build them just because. TP Cairns are those little rock mounds attempting to hide evidence of one’s bowel movements or bladder relief, complete with wads of toilet paper peeping between the rocks. Eeew. People who hike a lot generally know to carry out used toilet paper in a plastic bag (we don’t allow burning in the park) or to dig a deep enough hole to deposit one’s, er, deposits. If one must use a rock for a lid, at least avoid the TP cling-ons. Another way to tick off a park ranger is to ignore all the No Pets on Trails and Pets Must Be On Leash signs. Especially if it’s Ranger Cindy’s day off and she has to be the one to tell Fido and Fifi’s humans (nicely) that they must remove the free-roaming dogs from the trail and put them on leashes when in approved areas. And then she has to call Dispatch because the dog’s owners have ignored her, since she wasn’t in uniform, and they feel entitled anyway. Park rangers manning entrance stations get really ticked off if you don’t stop at the stop sign right outside their window, if you blow past – coming or going – despite the speed limit signs, or if an employee or park resident impatiently zips around the booth (into the opposite lane) because he or she can’t wait an extra few minutes for the visitors to be processed in. Heck I feel like this Taco Stand needs a row of sand-filled barrels like those that protect toll booths on the interstates, the way some people drive. Also if you know you’re coming into a park, and you stashed your Senior or Annual Pass in the trailer you’re towing behind you, and have to hold up the line running back to rummage through it so you can get in for free, entrance station rangers work hard to be “warm and enthusiastic” when you do that. Being loud and noisy on a hiking trail is likely to tick off a park ranger (on duty or off), because we are often birding, hoping to see a panther or a bear, or enjoying the peace and quiet. It’s not unusual to hear entire conversations from a quarter mile away on some of the popular trails in the park. Of course, if we are in the group that is having a good time, that’s different. And if you see someone photographing a bird or an animal, don’t just blow past them and then say “sorry” after you’ve scared the animal off. Do you know how hard it is to get a Bewick’s wren close enough and in good lighting? You could have stopped your headlong rush for a moment until I was done photographing it, couldn’t you? Another way to tick off a park ranger is to leave your Most Important Name etched on a prickly pear pad or a Texas madrone tree bark, or on a stone next to Indian petroglyphs or pictographs. I’m making a photographic collection of this kind of graffiti, and will make a voodoo doll and conjure up spells upon Kevin and Lacey and Gunther and whomever else so blatantly disrespected nature and park property. Of course, even park rangers don’t always do things the way they’re supposed to. And when I do something ignernt or stoopid, that really ticks me off. I’ve been humbled twice now by questions about dinosaurs. One adorable five-year-old sat in the back seat of his parents’ car as it pulled up to my entrance station window. Dad rolled down the window and the boy, with a book in his lap, asked me if we had any “Piscacaddyquoddymongasaurs” in the park. (Nods to Garrison Keillor). Whatever the real name was, I had never heard of it. He also wanted to know if we had a paleontologist in the park, so I sheepishly referred him to our geologist. Couple weeks ago I was roving at Ernst Tinaja, which is a little gem of a rock pool on the rugged Old Ore Road. Roving means I’m in my park ranger uniform, being official, roving around the park. 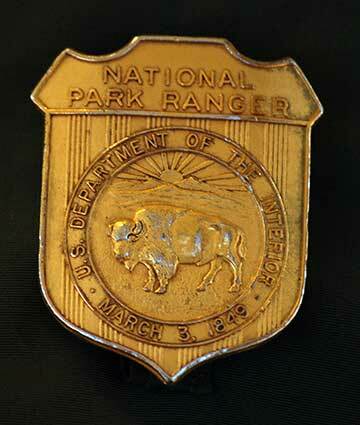 That excites some folk, who tell their kids, “Hey, there’s a park ranger!” And I answer, “Where?” and look around. Ha ha. Or they’ll say, “If I fall in this pool we have a park ranger here to help me out.” Ha and ha. I blinked. “Uh, maaaayybeeeeee.” I said. “Ask me about birds, why don’t you?” Geez what is it with kids and dinosaurs? Fossils are DEAD for pete’s sake. Why aren’t they studying birds? Learning their names? Buying binoculars? Reading bird books? I told my supervisor of my humiliating lack of geologic/paleontological knowledge. He said I could use the next dinosaur question as a segue into birds. After all, when I was nine years old I knew the archaeopteryx was the “first bird,” and studied a photo of its skeleton – both reptilian yet with the first evidence of feathers. I even wanted to be an ornithologist, and looked up all the bird names in the dictionary and made a list. So maybe I can ignite a little bird craziness into some of these dino-crazed kids. In the meantime I did brush up on some of the fossils discovered in the park, and can speak a little more knowledgeably about the Alamosaurus (like brontosaurus), the Quetzalcoatlus (huge flying reptile), and the 50-foot long crocodiles that roamed here. But don’t pull rank on the Mesozoic, Triassic, Cretaceous stuff – it all belongs in that mush pile called”prehistory” in my mushy brain, try as I might to make sense of it. Some scientists even refer to birds as living dinosaurs. So kids, be warned. Ask me about dinosaurs and you’ll get a lesson on birds. Like it or not!